Jack's a retired ex-cop from New York, seeking the simple life in Cherringham. Sarah's a Web designer who's moved back to the village find herself. But their lives are anything but quiet as the two team up to solve Cherringham's criminal mysteries. This compilation contains episodes 1 - 3: MURDER ON THAMES, MYSTERY AT THE MANOR and MURDER BY MOONLIGHT. Here Jack and Sarah investigate a suicide in the River Thames - or was it murder? They investigate an "accidental" fire with deadly consequences, and they nab the culprit behind the Rotary Club choir poisoning. 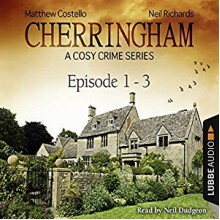 Cherringham is a series à la Charles Dickens, with a new mystery thriller released each month. Set in the sleepy English village of Cherringham, the detective series brings together an unlikely sleuthing duo: English web designer Sarah and American ex-cop Jack. Thrilling and deadly - but with a spot of tea - it's like Rosamunde Pilcher meets Inspector Barnaby. Each of the self-contained episodes is a quick listen for the morning commute, while waiting for the doctor, or when curling up with a hot cuppa.